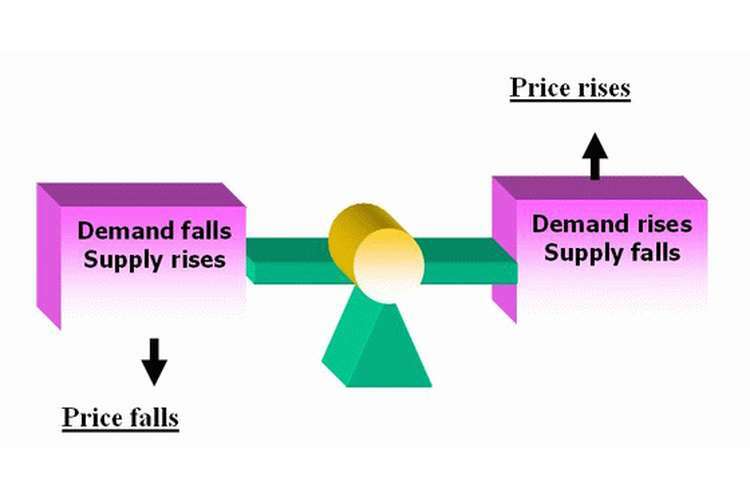 This is a solution of economics demand supply assignment help that describe about how quantity of demand and supply fluctuate when price reduce and increase of a product in a market. (a) Explain why the law of demand applies to food just as it does to all other goods and services. According to the law of supply the amount of good supplied increase with the elevation in market price of the product and falls as the price falls. On the contrary the law of demand explains that the quality of a good demanded falls with elevation in its market price and vice verse. The law of demand is found to be applicable to food products as there is presence of a substitute and an income effect that sustain each other. More elaborately it can be stated that when there is a price rise in food products, people opt for buying the other substitutes of the costlier food products in order to sustain. Suppose the food items served in restaurant are costlier hence people generally prefer consume homemade foods that are comparatively cheaper. It is also essential to note that price elevation also exert a negative impact over the income effect, hence people show a tendency to buy lesser quantity of food (Hubbard & O'Brien, 2008). Therefore considering both the aspects it can be inferred that an elevation in food price lowers the demand of the food products. (b) Explain how the substitution effect influences food purchases. Provide some examples of substitutions that people might make when the price of food rises and other things remain the same. In response to the above mentioned question it can be stated that when there is a market price elevation of food products majority of the population prefer to purchase those food items that are comparatively cheaper. It can be further added that individuals tend to consume the cheaper food products that serve as a substitute to the expensive food items available in the market. For example if the market price of a particular variety of rice in increased, majority of the population will tend to purchase the cheaper variety of rice available in the market. Hence the cheaper variety of rice will become a substitute to the expensive variety of rice available in the market. In this context it can be further stated if the market price of non-vegetarian food products increase, majority of the population shall opt to consume the vegetarian food products that are available in the market at a comparatively lower price. The vegetarian food items shall serve as a substitute to the costlier non-vegetarian food items available in the market. Also the overall consumption of food by the population shall also be compromised in order to sustain with the elevated market price of the food products (Prasch, 2008). (c) Explain how the income effect influences food purchases and provide some examples of the income effect that might occur when the price of food rises and other things remain the same. The demand for food is found to bear a complimentary association with the income effect of the population. A significant impact of the income effect is visible on the food purchase made. In this context it can be stated that a rise in market price of the food items causes a negative impact on the income effect of the population. Rise in food price reduced the gross income of the population subsequently lowering the overall demand of the food products. People tend to cut of restaurant expenses in order to sustain the impact of price rise of food products. Citing the situation of economically weaker and under developed nations, the overall tendency of the population to consume lesser quantity of food is clearly evident to support their livelihood. The situation is worst in extremely poor nations where people almost starve without any food. In such extreme situation starvation become a substitute for price rise in food products (Prasch, 2008). (a) Why is the land price raising in the metropolitan cities and what are the major drivers of rising house prices in these cities? An insight in the present real estate market condition of Australia indicate a continuous price rise wherein Sydney faced the biggest increase with the price of residential units surging by 19.9% during the third quarter of 2015. The fact that the Reserve Bank of Australia (RBA) has kept its cash rate at a record low of 2% after cutting it by 25 basis points each in February and in May last year (2015) can be considered as one of the potential factors supporting a progressive real estate price rise. The other driver favoring increased purchase of real estate property by the foreign investors particularly the Chinese for whom Australia has become one of the most attractive destinations. Reports reveal that the proposed foreign investment in Australia’s real estate property market surged to AU$ 34.7 billion in 2013-2014, according to the Foreign Investment Review Board (FIRB) (Guide, 2016). Citing the example of Sydney it can be stated that urban consolidation become one of the key drivers leading to severe housing un-affordability ("The great Australian property myth", 2014). (b) Using an appropriate diagram, explain your answer in part (a) above. The above given diagram explain the rise in the property prices in the metropolitan cities in Australia. In the right diagram it can be seen that as the RBA has reduced the cash rate, there is a sudden increase in the construction costs (from CC0 to CC1) and the land business development will become less profitable which will in turn make them to be more selective in the selection of the land for the development (Abs.gov.au, 2016). This will also result in certain developers leaving the market. Thus the quantity of the supply of the land will decrease (From HS0 to HS1), this will trigger a reduction in the supply of the developed land (From SH0 to SH1).The reduction in the supply of the land available for development, will trigger a surge in the prices of the available land and the land prices will rise (From R0 to R1). (c) Is the supply of land in in the metropolitan cities perfectly inelastic? Why? Discuss. Prior addressing the above question it is essential to understand that one of the important traits of the demand curve is its sensitivity of quantity demanded to price alterations and this sensitivity can be identified as price elasticity of demand. However it is also essential to note that if price elasticity is less than one, demand is considered to be inelastic. On the other hand the land supply for development of real estate property can be explained as the quantity of land supplied for the construction of housing units at various prices wherein an upwards slopping curve reflect the fundamental law o supply explaining greater quantity is supplied at a higher price (McKenzie & Betts, 2006). Citing the situation of Australia, particularly of Sydney it is observed that as implementation of government policies has restricted the availability of new land for housing developments the supply of land can be considered as perfectly inelastic. It is the Sate government of Australia who control the supply of land for new housing development directly affecting the market price of real estate property of the country. In support of this it can be further added that to support higher density developments the government policies issues in Australia limit favor new housing developments within the city premises with limiting the supply of land for real estate development on the outer fringe of the city (Gitelman & Otto, 2012). 3. Some Australian state and territory governments have banned or are planning to ban plastic shopping bags due to negative externalities rising from their excessive use. A negative externality can be explained as a cost that is suffered by a third party due to an economic transaction. In such a transaction, the producer and the consumer are considered as the first and second parties respectively while the third party can be another individual, an organization, resource that is indirectly affected. Important to note that externalities are usually referred as ‘spill over effects’ whereas a negative externality is considered as an external cost. Citing the example of production and heavy usage of plastic bags in Australia a number of factors responsible for negative externality can be conveyed. The aesthetic damage created by landfills containing plastic wastes, adverse effect on marine life due to heavy deposition of plastic wastes in the sea beds, the hazardous emissions caused by plastic incineration and the economic inefficiency resulted due to difficulty in recycling of the plastic wastes can be highlighted. However the causal factors responsible for generation of such negative externalities as a consequence of heavy use of plastic bags in the absence of incentives within the current legislation for establishment of an effective recycling infrastructure. The presence of fluctuating market conditions for recycled input materials are also another reason in this respect (Flores & Mario, 2008). Government intervention can be considered as one of the most effective options for regulating the above mentioned negative externalities due to heavy usage of plastic bags. Market incentives should be formulated in order to promote greater recycling of the plastic materials that can further support creating greater job opportunities, fuel cost savings along with favoring sustainability issues. Subsidies to promote research in the recycling industry to encourage the post-consumer plastic materials use in the manufacture of fiber for which 54% of PET recycled material can be used an as input can be another effective strategy in this respect. Further embedding awareness regarding the significance and benefits of plastic recycling, marginal benefits among the plastic manufacturers and consumers is also effective in reducing the above mentioned negative externalities. Incorporation of marginal benefits to plastic manufacture can also enhance a high level to produce structural alteration in the plastic industry (Flores & Mario, 2008). (b) Draw a graph to illustrate how plastic containers and bags create welfare loss. The above graphical expression indicates the welfare loss resulted as a result of consumption of plastic bottles. Referring to the above placed graph it can be stated that negative externalities are generated from the consumption of plastic bottles. The market will be at the equilibrium position if MSB =MSC. But at present the market it evident to consume at an output of MCS=MPB. Welfare loss indicated by the triangle is due to the divergence between MPB and MSB. Hence it can be inferred that ban in plastic bottles in Australia if assumed can result in decrease of usage of plastic bottles along with reduction in the market price gradually shifting the market towards an equilibrium position. Hence referring to the above included graph it can be inferred that significant extent of welfare loss is resulted due to high usage of plastic bottles. The market equilibrium is also lowered. Abs.gov.au. (2016). 6416.0 - Residential Property Price Indexes: Eight Capital Cities, Mar 2016. [online] Available at: http://www.abs.gov.au/ausstats/abs@.nsf/mf/6416.0 [Accessed 13 Sep. 2016]. Hubbard, R. & O'Brien, A. (2008). Economics. Upper Saddle River, N.J.: Pearson Prentice Hall. McKenzie, D. & Betts, R. (2006). Essentials of real estate economics. Mason, OH: Thomson/South-Western.